Add/Change product is used to specify computer products in product categories. This means that you can add monitors Hansol, Samsung, Viewsonic, DTK, ... in product category Monitors or Intel, AMD, .. in product category Processors, etc. Each product is defined with its name, number of items in storage, buying and selling price (for aditional information view input of new products form). 5. Group of the product and press 'Save' button. � To activate bar code reader, go to bar code reader field, press F10 and use bar code reader to read component bar code. You can enter bar code manualy if you want. 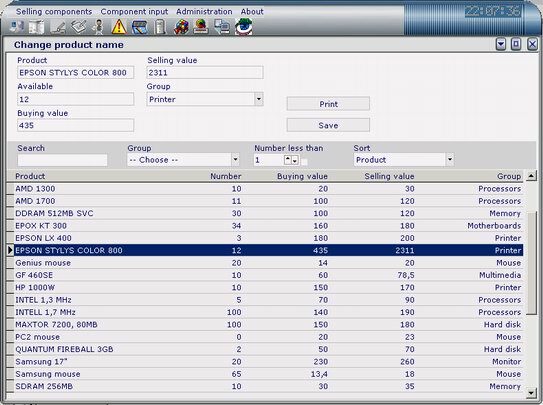 � You can CHANGE each of the entered products, just click on the product name in the list, change desired data and press 'Save' button. � You can DELETE each of the entered products, by pressing on 'Delete' button. � There is also quick search option if you need to find some product in the list.